The University of Ulster has launched a new-look Institute of Nursing Research with the vision to be world-leading in research and development in the nursing sector. The new look Institute of Nursing Research will bring an improved structure to what is already an internationally renowned centre of excellence. The Institute is ranked in the top three Universities in the UK for research, with 100 per cent of nursing research of international standard and 40 per cent rated as ‘world leading’, which in 2009/10 generated approximately £1.8 million of research grant income. Four Institute Research Centres, each with a leader, have been formed to carry on this outstanding work and to shape its growing reputation. 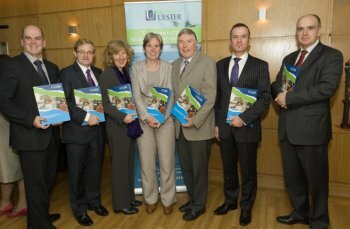 These are – the Centre for Intellectual and Developmental Disabilities, lead by Professor Roy McConkey; Managing Chronic Illness, lead by Professor Vivien Coates; Maternal, Foetal and Infant Research, lead by Professor Helen Dolk; and Person Centred Practice, lead by Professor Brendan McCormack. Professor McCormack, who is also Director of the Institute of Nursing Research, said that the new developments will boost the University’s research output. “We have a vision to be world-leading in research and development that enhances the knowledge, expertise and engaged scholarship of nursing, midwifery and public health research,” he said. “We must always consider what the core reason is in nursing research, and that is fundamentally the improvement of care and services delivered to the public. The research that we undertake today has a direct impact benefiting those who need our support in healthcare organisations. It is hoped that the new structure will also provide further opportunities for the University to develop partnerships with other institutes and universities as well as healthcare professionals, which can grow areas of new research strength and capitalise on existing areas of strength. Professor Hugh McKenna, Dean of the Faculty of Life and Health Sciences, said: “The four Research Centres within the Institute focus on all aspects of care, from unborn children to older people, from people with mental and physical disabilities, to cancer patients and others with chronic illness.